A new study co-authored by an interdisciplinary group of scientists highlights the importance of linking social and ecological sciences to understand drivers of coral reef health. 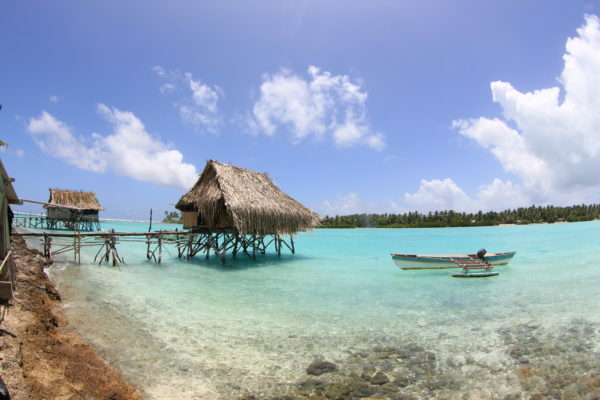 In order to bridge this gap between ecology and social sciences, lead author Joshua Cinner and co-authors “develop a Bayesian hierarchical model, using data from more than 2,500 reefs worldwide, to predict reef fish biomass based on various socioeconomic drivers and environmental conditions,” as described by the Editor’s Summary. From this model, they identified 15 “bright spots”, or reefs that are performing significantly better than expected. 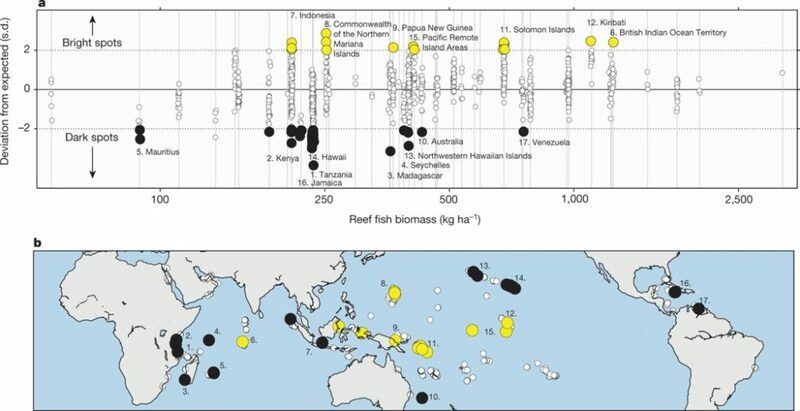 Specifically, this means that reef fish biomass was much higher than expected. Conversely, it also identified “dark spots”, where reefs were seemingly overfished and in poorer condition, despite expectations for success. Dr. Sandin, an author of this study, provides commentary in a San Diego Union Tribune article, found here. You can find the full length article in Nature here. a, Each site’s deviation from expected biomass (y axis) along a gradient of nation/state mean biomass (x axis). The 50 sites with biomass values >2 standard deviations above or below expected values were considered bright (yellow) and dark (black) spots, respectively. Each grey vertical line represents a nation/state; those with bright or dark spots are labelled and numbered. There can be multiple bright or dark spots in each nation/state. b, Map highlighting bright and dark spots with large circles, and other sites in small circles. Numbers correspond to panel a.